Evangeline Lilly of The Hobbit: The Desolation of Smaug is reportedly in talks to take on the female lead in the upcoming Marvel movie Ant-Man. The Ant-Man cast looks set to be given another high-profile boost with the addition of Evangeline Lilly, who according to Variety is now in "early talks" to join the film as the female lead. 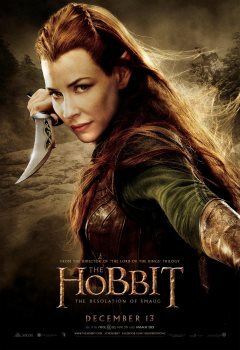 Lilly is best known for her work as series regular Kate Austen in Lost, and more recently as Tauriel in The Hobbit: The Desolation of Smaug. It's not known what role she'll play but the word on the street is that it won't be a pre-existing character like Janet Van Dyne, AKA the Wasp and the wife of original Ant-Man Henry Pym. Instead, "insiders" say she'll play Pym's daughter, who becomes the love interest of second-gen Ant-Man Scott Lang. In the comics, Pym doesn't have a daughter and Lang becomes Ant-Man by stealing Pym's super-suit. Marvel hasn't yet commented but the continuity change-up makes sense as an easy (and not terribly heavy) way to tie the two characters together. It also fits from an age perspective: Lilly is 34, while Paul Rudd, starring as Lang, is 44 and Michael Douglas, who plays Pym, is 69.